Inside the Caricature Museum in Mexico City. Image via AP. “Artists thrive on turbulence & estrangement from Establishment/authority,” the writer Joyce Carol Oates tweeted earlier this month, “so [a Trump] presidency would not be a total disaster, for some.” It was a typical Oates sentiment, born of the kind of counterintuitive perspective that’s always had currency in the culture world. She followed up with this observation: “In times of political/social malaise, the powerful attractions & refuge of art. At once, one is transported to a timeless & more human realm.” It’s easy enough to dismiss this as just another Joyce Carol Oates tweet, by now a staple of Twitter eye-rolling. An observation born of a certain immunity from the material reality of Donald Trump’s platforms, inevitably Oates herself is the “some” she references. But that opinion—that Trump is somehow a savior of art—seems to have taken hold. Sometimes the masterpieces come instantaneously after trauma, as with Picasso’s Guernica or Goya’s Disasters of War. More often there’s a lag between events and art. In the late 1940s, Abstract Expressionists finally transformed the pain and horror of the Depression and World War II into existentially devastating painting. The irony of these lags is that a cool decade like the 1950s produced an art as emotionally hot as AbEx while the hot culture of the 1960s enshrined the cool art of Jasper Johns, Robert Rauschenberg, Pop, and Minimalism. More recently, the group mind responded to the AIDS crisis of the Reagan era with one of the greatest collective works of folk art ever made: the AIDS Memorial Quilt. Which is actually a good case study in what gives oppositional art its charge: It gains in power by being more than the sum of its subject matter. Like Oates’s tweets, Saltz’s argument is romantic at its core, a longing for a mythical time in which artists were still “aristocratic bohemians,” hoping for such a cool vision of the artist to be reborn. There’s no doubt that the arts work as a critique of human folly and political oppression—Saltz’s examples are poignant ones; there’s no disagreement that strife inspired the production of Goya’s etchings or that the atrocities of the Vietnam war fueled Martha Rosler’s House Beautiful series or that Otto Dix’s reflection on World War I remain some of the most grotesque and haunting depictions of the long-term effects of war. And yet, none of these artists were the outsiders that Saltz so craves: Goya’s career was long-established in the Spanish court and Rosler benefitted from a valued culture of dissent in Vietnam-era America. And Dix, that great chronicler of the Weimar Republic, was later labeled degenerate and many of his paintings burned. And what of the AIDS Memorial Quilt? 48,000 pieces of a massive quilt stitched together by Americans who had lost a loved one to the AIDS crisis, originally stretched across the National Mall in 1987 as an act in an act of protest of Ronald Reagan’s refusal to acknowledge the existence of AIDS and the deaths of thousands. It seems strange that Saltz would treat it simply as an object, as a work of folk art (the label itself is the ultimate fetish of the outsider status), that the takeaway from the names of tens of thousands of dead men and women is simple objecthood. Where Saltz sees resistance, I see death purposefully and callously rendered on a group because they lived outside of the moral boundaries established by the state. Perhaps I’m wrong, but I imagine that the producers of those quilting squares, all of which include the name of an AIDS patient, would prefer their loved one to their great act of folksy resistance. The artist-as-bohemian stereotype is underpinned by the fundamental belief that great art exists in opposition to power instead of in collusion with it. But the production of art requires stability granted by position, its producers either have money or access to institutions that provide them with money, as well as time and training. Jackson Pollock had access to the traditional methods of training and the project of Abstract Expressionism was boosted by the Museum of Modern Art, then headed by Nelson Rockefeller (who removed a commission mural by Diego Rivera because it depicted Lenin). And, rather unwittingly, the “devastating work” of Abstract Expressionism found itself a vehicle for American nationalism, particularly at a time when the country was desperate to prove that avant-gardism and Communism were not synonymous. But such romantic ideas about resistance rarely want to utter the word Communism or remember Joseph McCarthy’s hunt for creatives that were too radical, too sympathetic. The radical dissent of art is only perceived as valuable—only preserved and nominated into the canon of great art—if those powerful institutions put their weight behind it. But power is a fickle thing and even well-meaning places that proclaim their liberal values are persuaded. McCarthy was aided by Hollywood and, as late as 2010, the National Gallery removed a work by David Wojnarowicz, a video installation that’s all anger and rage over the AIDS crisis of the 1980s, one that killed his partner and would eventually take his life, too. Wojnarowicz’s criticism, directed at the Catholic church, was too controversial for the walls of our national museum. Sure, artists can produce work outside of these institutions return, as Saltz argues, to “our rightful outsider gypsy position.” But there is no historic map for that—writing novels and making art requires capital and investment and security, none of which are evenly distributed. 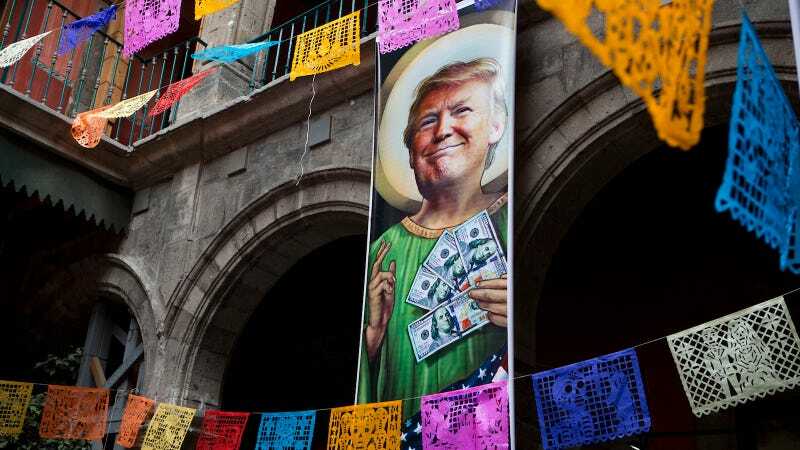 But beyond the institutional power that has always occupied an uneasy place in the art world, the argument that repression is good for art doesn’t seem to grapple with highbrow culture’s silent consensus with some of Donald Trump’s ideologies. The Guerrilla Girls have spent decades critiquing the art world’s penchant for racism and sexism and feminist writers and artists of color have long criticized histories that celebrate great male artists positioned against the world as little more than romantic fiction. And yet here they are, repeated and presented as a transgressive argument, as though none of these interventions were heard. Maybe the arts will seize this moment and closely examine itself, maybe the myth of the great bohemian outsider artist will finally be retired, and the arts will become a place of resistance and radical representation. But with arguments like Saltz’s which deeply reinvest in those ideologies, it seems unlikely.